Far across the expanse of vast open space it captures you: a twisted, warped barricade of metal snaking across the sand. Industrial and aggressive, its torched surface and sharp shadows fill you with unease. But there is more depth to your initial perception: something deeper inside shines and undulates and draws you near. 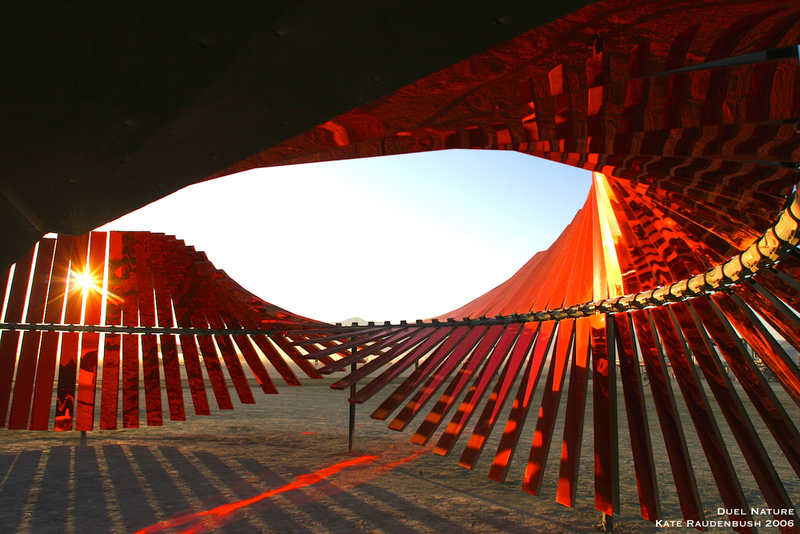 The closer you venture, the more the sculpture reveals itself to you. And things are not what they appear. It is not a wall you are confronted with, but an enormous double helix of circular steel spiraling over the surface of the Playa. Everything about its coarse steel exterior suggests violence and destruction and division: but there are glimpses of fiery light inside, and the only way in - is through it. Crouching close to the ground you struggle past the thrusting eight-foot steel beams to find yourself surrounded by a different world entirely. What was once fearful is now energizing. Three hundred sixty degrees of reflection envelops you in an unbroken, thirty-foot wide, red organic spiral – the DNA of our shared genetic bond. Now this DNA spiral binds our community together physically, and encircles us into its protective embrace. One hundred twenty wings of glowing red mirror reflect our world, not just to ourselves, but to one another. Surrounded and united by this structure of duality, opposite worlds co-exist and collide within one form and within us: hope and fear. This dichotomy is a matter of perspective, but it is also matter of choice: which world do we choose to live in? Which world do we choose to create? This is our struggle with ourselves. This is the human condition. This is our Duel Nature. Duel Nature is a sculpture based on the double helix structure of the human DNA. It’s two surfaces, the corroded steel on the exterior, and the red mirror on the interior, create environments that represent the complex struggle of mankind with itself: the duel between the destructive force and the life force. Most poignantly for me, it speaks to our future, and the fight to save us from ourselves: damnation or salvation? The greatest fear I have is that we have lost sight of – or lost the will to see - who we are, and what bonds us together. We are destroying ourselves because of our differences, when at the basic DNA level, we are all the same. The exterior surface of steel barricade is what we are becoming, and the vibrant blood red mirror is who we are inside. “We are all made of star stuff”, as Carl Sagan once said, and therein lies my hope for us. We have an incredible capacity for creation, compassion and discovery, and for love, selflessness and celebration, but we get trapped looking for control over what makes us different, hoarding everything for ourselves. It is a tragic dichotomy: we are a species at war with ourselves, yet, we are our only hope for survival. That is our Duel Nature. The 2006 theme for Burning Man, The Future: Hope and Fear, prompted me to imagine a true communal gathering space, with its large form echoing our microscopic blueprint. I noticed that even though last year’s sculpture, Stadium of the Self, was technically built for the individual participant, people crammed themselves in there 8 deep! They wanted to be together. This is ultimately what the shape and scale of Duel Nature is about. All human life shares the same blueprint: as we are united in our genetic code, so too are we brought together to experience this communal circle of reflected light. It is interactive sculpture that, I believe, is one of the true community builder at Burning Man, bringing people together to experience something, not just to observe it. Duel Nature is about community, unity and identity. Like ourselves, it is a combination of opposite elements to create a single organic sculpture: An aggressive war-like exterior that recalls the wars and walls we build between nations and one another (Duel) , and an interior world that reflects our microscopic one-ness (Nature). There is a verse in the Tao Te Ching that says “We stand before it, and it has no beginning, we follow it and it has no end.” Like life, the circular spiral is in perpetual flux. But, if you stand at its true center all you can see is vibrant red reflection of our shared reality: so that the world you see is a matter of perspective - but it is also a matter of choice. Inside, the physical wave structure of mirror creates corner areas of safety in the 4 vertical wings, and 4 areas of tension, as the wings rise to a thrusting horizontal and then spiral toward the sky, leading your gaze across the wave form to the surrounding world. As night falls, Duel Nature comes alive as a primal gathering space with a sculptural fire cauldron at its center. I imagine the unbelievable drama of a performance of fire-spinners flashing in the multitudes of fiery mirror like a primal strobe light, while twenty-first century red LED lights twist and pulse their way around the perimeter of the spiral, beckoning travelers from across the playa. The light of the fire and the communal energy that surrounds it is reflected in the red mirror and a kaleidoscopic red glow fills the interior. What was a dichotomy of two contrasting ideas now becomes one pulsing atom of life: the LEDs are its electrons, and the fire, its nucleus.